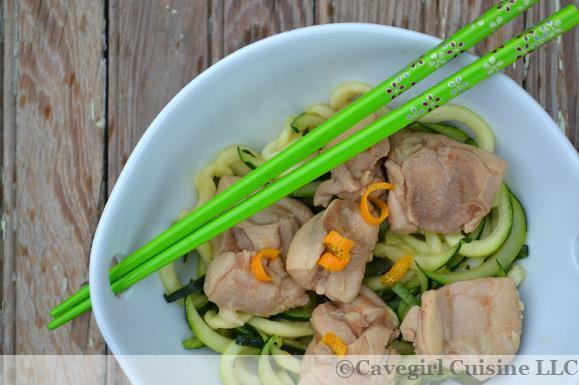 This Slow Cooker Orange Chicken with Spiralized Zucchini is a simple dish that requires minimal prep time. The zucchini noodles are optional…serve over rice if that is your thang. The star here is the chicken. The preparation is simple, but the flavors are explosive! Place chicken pieces in the slow cooker. In a medium bowl, combine maple syrup, Sriracha, orange juice, orange rind, coconut aminos, apple cider vinegar, flour, ginger, garlic, and chicken broth. Right before serving, spiral your zucchini (or use a veggie peeler and create long zucchini strips). Heat sesame oil in a large skillet and add zucchini. Toss. Ladle a small amount of the slow cooker liquid into the skillet. Toss until tender. Divide zucchini into bowls. Using a slotted spoon, remove chicken from the slow cooker place over zucchini. You can serve as-is, or garnish with a little more orange rind or even some cilantro.